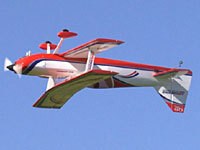 When it comes to RC airplanes, I am of the “two sets of wings are better than one” kind of guys. For any model to perform properly and be safe to fly, it has to be properly balanced. This is especially true for multi-wing models. As a basic rule, you first find the MAC or “Mean Aerodynamic Chord” of your biplane, then establish the CG Range from there. If you are building a kit or assembling an ARF, start where the instructions indicate. If you don’t have the information of it looks weird somehow, compute the range and see for yourself. Manufacturers have been known to get the numbers wrong. Why find the range? The CG Balance works in both directions. You model can be too nose heavy or too tail heavy. Nose heaviness leads to less elevator authority and increases landing speeds while making it harder to flare to bleed off speed. Tail heaviness lessens stability and increases pitch responsiveness. Sometimes to the point where you loose control. So find the limits for your model’s 25 to 33 percent sweet spot range and then work from there by doing test flights to check how your biplane responds. 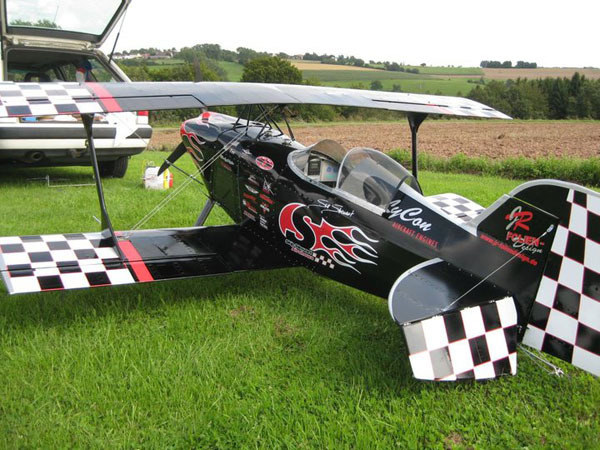 (Above) the Pitts Special is a common aerobatic biplane and it has a swept back top wing. The illustration below shows how to find the MAC and thus your 25 and 33 percent MAC locations for the CG range. (Above) The Albatross D.III is a prime example of a plane with larger top wing than its lower wing. The Illustration below, shows the side view illustration for finding the model’s Center of Lift (CL). Placing the CG forward or aft of the CL effects the model’s performance. These techniques for finding the center of lift and the MAC and CG locations for Biplanes have worked on several different models. They are meant to get you into the ballpark so you can perform a safe and controllable test flight. After you fly your model, you can make fine adjustments to dial in the balance point that you are most comfortable with. Giant Scale or not, your biplane has to have the proper CG balance point to maximize its performance. It goes for both being too tail heavy as well as too nose heavy. Don’t let this happen to your multi-wing airplane. Proper balance is the most important thing for safe RC flights. OK, so where did you come up with 57%, and why? I have noticed that for a quickie check, biplanes all seem to balance right around the leading edge of the bottom wing. Not super accurate but this would get you in the air. Hey Bruce. this illustration was based on the work Andy Lennon did in his book, “Basics of RC Model Aerodynamics”. As you mentioned, all the comments here in this post are Ball-park and will get you safely into the air for further flight testing and CG adjustments. Bruce- the author left out a step. The example Albatross has different sized wings. The top wing area is 57% of the total area of both wings, so you figure out where the cg should be for each wing, connect them with a line and then find a point on the line 57% up toward the top wing. Lots of biplanes have about the same stagger, but do not try your short cut on a Jenny, with no stagger or a Beech staggering with reverse stagger. FYI: The entire right side of each diagram was clipped off and unusable when viewing from my iPhone. It looks like a great article. Check it now, I adjusted the images. I can’t see the same screen as you. Thank You for the data. I dont trust ARF CG locations as with my 72 inch span mustang the drawings were at least 1.75 inches out. I managed to just save the model. The supplier said “we dont just sell planes , we sell excitement”. Now I can double check my 65 inch span Bucker Jungmeister.